can i just say that i love your blog. probably because it's just like listening to you tell a story... your voice really comes out (and i'm totally not just saying that cause i'm an English teacher). Wow your rats sound adorable!! 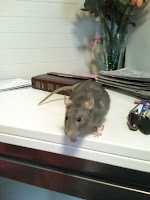 Could I possibly use some of your pictures for my new site Rat Info ? If so could you post them on the Rat Forum to let me know I have consent? I would love to add them to out Cute Rat Pictures page!!! There are also some really awesome Homemade Rat Toys tutorials if you wanted to make some super easy toys for your ratties.